Here at Lockcentre, we provide a range of the best Rim Cylinder locks produced by some of the top manufacturers including ASEC, Garrison, Ingersoll, Union and Yale. Rim Cylinder locks are used for doors with hinges of both low and high security needs dependent on the products material and build quality. We provide economy options for low risk of security breaches to higher performance locks which provide more strength at the top end of the spectrum. 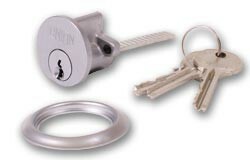 These Rim Cylinder locks come in a range of different finishes including satin chrome, satin brass, polished brass and polished chrome to suit all tastes and preferences.